The Rock of Monaco served as a shelter for the area's early humans from the end of the Paleolithic period, approximately 400,000 BC, evidence of which has been found in a cave in St. Judist's Gardens. According to the accounts of historian Diodorus Siculus and geographer Strabo, the area's first permanent settlers were the mountain-dwelling Ligures, who emigrated from their native city of Genoa, Italy. However, the ancient Ligurian language, which probably was Indo-European, is not directly connected to the Italian dialect spoken by the modern inhabitants of Liguria, nor to the modern Monegasque language. During the 6th-century BC. Phocaeans from Massalia (modern day Marseille) founded the colony of Monoikos. The name of the colony derives from the local veneration of the Greek demigod Hercules, also later adopted by the Romans, who was said to have constructed the ancient path that passed through the region from Spain to Italy. The Roman emperor Julian also wrote of Hercules's construction of Monaco's port and a coastal road. The road was dotted with altars to Hercules, and a temple dedicated to him was established on the Rock of Monaco. The name Port Hercules was subsequently used for the ancient port. Monoeci meaning "Single One" or Monoikos meaning "Single House" could be a reference to Hercules or his temple, or the isolated community inhabiting the area around the rock. According to the "travels of Hercules" theme, also documented by Diodorus Siculus and Strabo, both Greeks and native Ligurian people asserted that Hercules passed through the area. 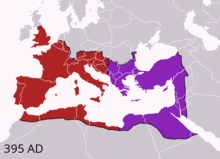 The division of the Empire after the death of Theodosius I, c. 395 AD superimposed on modern borders. 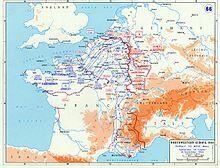 After the Gallic Wars, Monoecus, which served as a stopping-point for Julius Caesar on his way to campaign in Greece, fell under Roman control as part of the Maritime Alps province (Gallia Transalpina). dictus autem Monoecus vel quod pulsis omnibus illic solus habitavit, vel quod in eius templo numquam aliquis deorum simul colitur. "either because Hercules drove off everyone else and lived there alone, or because in his temple no other of the gods is worshipped at the same time." No temple to Hercules has been found at Monaco (see also Lucan 1.405. ), although the rocky ground and dense conurbation make future excavations unlikely. The port is mentioned in Pliny the Elder's Natural History (III.v) and in Tacitus's Histories (III.42), when Fabius Valens was forced to put into the port (Fabius Valens e sinu Pisano segnitia maris aut adversante vento portum Herculis Monoeci depellitur). Monaco remained under Roman control until the collapse of the Western Roman Empire in 476. The city was then under the domain of Odoacer until his fall at the hands of the Ostrogoths in the late 5th century. Monaco was recaptured by the Romans during the reign of Justinian in the mid-6th century and was held until its capture by the Lombards in the 7th century. Monaco then passed hands between the Lombards and Franks. Though these raids left the area almost entirely depopulated, the Saracens were expelled in 975, and by the 11th century the area was again populated by Ligurians. In 1191, Holy Roman Emperor Henry VI granted suzerainty over the area to the city of Genoa, the native home of the Ligurians. On 10 June 1215, a detachment of Genoese Ghibellines led by Fulco del Cassello began the construction of a fortress atop the Rock of Monaco. This date is often cited as the beginning of Monaco's modern history. As the Ghibellines intended their fortress to be a strategic military stronghold and center of control for the area, they set about creating a settlement around the base of the Rock to support the garrison; in an attempt to lure residents from Genoa and the surrounding cities, they offered land grants and tax exemption to new settlers. The Grimaldis, descended from Otto Canella and taking their name from his son Grimaldo, were an ancient and prominent Guelphic Genoese family. Members of this family, in the course of the civil strife in Genoa between the Guelphs and Ghibellines, took refuge in Monaco, accompanied by various other Guelphic families, most notably the Fieschis. Francesco Grimaldi seized the Rock of Monaco in 1297, starting the Grimaldi dynasty, under the sovereignty of the Republic of Genoa. The Grimaldis acquired Menton in 1346 and Roquebrune in 1355, enlarging their possessions. In 1338 Monegasque ships under the command of Carlo Grimaldi participated, along with those of France and Genoa, in the English Channel naval campaign. Plunder from the sack of Southampton was brought back to Monaco, contributing to the principality's prosperity. Honoré II, Prince of Monaco secured recognition of his independent sovereignty from Spain in 1633, and then from Louis XIII of France by the Treaty of Péronne (1641). 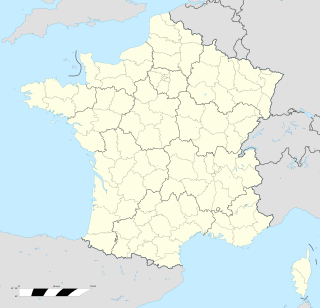 Since then the area has remained under the control of the Grimaldi family to the present day, except when under French control during the French revolution from 1793 to May 17, 1814, as part of the département of Alpes-Maritimes. The principality was re-established in 1814, only to be designated a protectorate of the Kingdom of Sardinia by the Congress of Vienna in 1815. Monaco remained in this position until 1860, when by the Treaty of Turin, Sardinia ceded to France the surrounding county of Nice (as well as Savoy). With the protectorate, that lasted nearly half a century, Italian was the official language of Monaco. The Monégasque dialect is closer to Italian than French, but influenced by both. During this time there was unrest in the towns of Menton and Roquebrune, which declared independence, hoping for annexation by Sardinia and participation in the Italian Risorgimento. The unrest continued until the ruling prince gave up his claim to the two towns (some 95% of the country), and they were ceded to France in return for four million francs. This transfer and Monaco's sovereignty was recognised by the Franco-Monegasque Treaty of 1861. Map of the territory of the "Free cities of Mentone & Roccabruna" (light blue) and the territory of Monaco (orange) in 1848. Those territories were the Principality of Monaco from the Renaissance until that year. Designated as a protectorate of the Kingdom of Sardinia in 1815 by the Congress of Vienna after Napoleon's defeat, Monaco's sovereignty was confirmed by the Franco-Monegasque Treaty of 1861. France accepted the existence of the Principality of Monaco, but annexed 95% of its former territory (the areas of Menton and Roquebrune). Monaco's military defense since then has been the responsibility of France. The Prince of Monaco was an absolute ruler until the Monegasque Revolution of 1910 forced him to proclaim a constitution in 1911. The famous Casino of Monte Carlo opened in 1863, organized by the Société des bains de mer de Monaco, which also ran the Hotel de Paris. Taxes paid by the S.B.M. have been plowed into Monaco's infrastructure. Economic development was spurred in the late 19th century with a railway link to France. In July 1918, a treaty was signed providing for limited French protection over Monaco. The treaty, written into the Treaty of Versailles, established that Monegasque policy would be aligned with French political, military, and economic interests. One of the motivations for the treaty was the upcoming Monaco Succession Crisis of 1918. While Prince Louis II's sympathies were strongly pro-French, he tried to keep Monaco neutral during World War II but supported the Vichy French government of his old army colleague, Marshal Philippe Pétain. Nonetheless, his tiny principality was tormented by domestic conflict partly as a result of Louis's indecisiveness, and also because the majority of the population was of Italian descent; many of them supported the fascist regime of Italy's Benito Mussolini. In November 1942, the Italian Army invaded and occupied Monaco. Soon after in September 1943, following Mussolini's fall in Italy, the German Army occupied Monaco and began the deportation of the Jewish population. Among them was René Blum, the prominent French Jew who founded the Ballet de l'Opera in Monte Carlo, was arrested in his Paris home and held in the Drancy deportation camp outside the French capital before being transported to the Auschwitz concentration camp, where he was later killed. Blum's colleague Raoul Gunsbourg, the director of the Opéra de Monte-Carlo, helped by the French Resistance, escaped arrest and fled to Switzerland. In August 1944, the Germans executed René Borghini, Joseph-Henri Lajoux and Esther Poggio, who were Resistance leaders. Under Prince Louis's secret orders, the Monaco police, often at great risk to themselves, warned in advance those people whom the Gestapo planned to arrest. The country was liberated, as German troops retreated, on 3 September 1944. The current ruler, Prince Albert II, succeeded his father Prince Rainier III in 2005. Prince Rainier, in turn, had acceded to the throne following the death of his grandfather, Prince Louis II, in 1949. The revised Constitution of Monaco, proclaimed in 1962, abolished capital punishment, provided for female suffrage, established a Supreme Court to guarantee fundamental liberties and made it difficult for a French national to transfer his or her residence there. In 1993, Monaco became a member of the United Nations with full voting rights. In 2002, a new treaty between France and Monaco clarifies that if there are no heirs to carry on the dynasty, the Principality will remain an independent nation, rather than be annexed by France. Monaco's military defense, however, is still the responsibility of France. The principality's mild climate, attractive scenery, and gambling facilities have made Monaco world-famous as a tourism and recreation centre. ^ a b c d P. Christiaan Klieger (29 November 2012). The Microstates of Europe: Designer Nations in a Post-Modern World. Lexington Books. pp. 165–. ISBN 978-0-7391-7427-2. ^ R. L. Rike (1987). Apex Omnium: Religion in the Res Gestae of Ammianus. University of California Press. pp. 24–. ISBN 978-0-520-05858-3. "Principality and Diocese of Monaco". The Catholic Encyclopedia. Retrieved May 6, 2005. "History of Monaco". Gale Force of Monaco. Archived from the original on April 18, 2005. Retrieved May 6, 2005. Kundahl, George G. (2017). The Riviera at War: World War II on the Cote d'Azur. London: I.B. Tauris. ISBN 9781784538712. Wikimedia Commons has media related to History of Monaco. Menton is a commune in the Alpes-Maritimes department in the Provence-Alpes-Côte d'Azur region in southeastern France. Monégasque is a variety of Ligurian, a Gallo-Italic language spoken in Monaco as well as nearby in Italy and France. Florestan I, Prince of Monaco was Prince of Monaco and Duke of Valentinois from 2 October 1841 until his death. He was born Tancrède Florestan Roger Louis Grimaldi the second son of Prince Honoré IV and Louise d'Aumont Mazarin and succeeded to the throne on the death of his brother, Honoré V.
Mentonasc is a Romance dialect historically spoken in and around Menton, France. It is classified as a dialect of Occitan and a sub-dialect of Vivaro-Alpine, with some strong influence from the neighbouring Intemelian Ligurian dialect spoken from Ventimiglia to San Remo. La Turbie is a commune in the Alpes-Maritimes department in southeastern France. The official language of Monaco is French. In addition, there are several other languages spoken, including Monégasque, the national language of the Monégasque people. Italian irredentism in Nice was the political movement supporting the annexation of the County of Nice to the Kingdom of Italy. The term was coined by Italian Irredentists. The postal history of Monaco can be traced to the principality’s first postmark in 1704. Stampless covers are known with both manuscript and handstamp postmarks for Monaco and Fort d'Hercule ; as the principality was once much larger, postmarks of the communes of Menton and Roquebrune prior to their 1848 secession might also be included. Monaco used Sardinian stamps from 1851 until 1860, when by the Treaty of Turin, Sardinia ceded to France the surrounding county of Nice and relinquished its protectorate over Monaco; French stamps with Monaco or Monte-Carlo postmarks were used thereafter. Two forms of cancellation are known for the French period. With the first, the postmark is on the cover away from the stamps; an obliterator with an identifying post office number 4222, or later 2387, inside a diamond of ink dots cancelled the actual stamps. The second applied the postmark directly on the stamps, as both a date stamp and cancel. All of these postal forerunners, particularly usages of Sardinian stamps with Monaco cancels, are far more valuable than the same stamps postally used in the issuing countries.